Many of us assume that as we age, there will be a certain amount of pain to endure. We think arthritis is a sure thing. Or, is it? And if so, is age really the only culprit? First of all, what is arthritis? It means “Inflammation, etiology unknown”. Where does the inflammation come from? There is the implied theory that we’ve just worn out our joints because we’ve lived so long! If that were true, then everyone over a certain age would have arthritis or worn joints. We know that knee pain, shoulder pain, hip pain, back pain comes from wear and tear. Well, most often patients present with one side or the other hurting –I hear it all the time “thank goodness my other knee feels great!” This phenomenon alone debunks the theory that time on earth is dictating joint wear and pain. While joint compression from age can be a factor would we really only have knee pain, shoulder pain, hip pain, and back pain on one side if pain was caused just by longevity? No, both sides would have arthritis pain. As Posture Alignment Specialists certified by Egoscue University, we evaluate bodies in pain all day every day– young and old, all sizes, shapes, injuries, surgeries, abilities and disabilities and condition levels. Most people come to us because they want pain relief – with knee pain, shoulder pain, hip pain, back pain, and ankle pain. 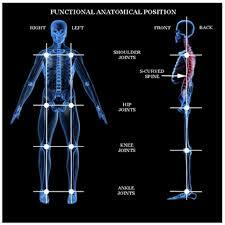 The simple and amazing thing is that they all have the same problem – their bodies are not properly aligned. What your body needs is not youth but alignment… the way it was intended. The earlier one understands the importance of alignment, the less arthritis has a chance! Notice the alignment showing the ankles, knees, hips, and shoulders vertically and horizontally aligned, the pelvis is neutral, the spine has an s-curve, and the knees and feet point straight ahead. When this isn’t what is happening in our bodies – for whatever reason (accident, surgery, work posture) – some muscles begin doing too much and some not enough. That is when bones are pulled out of alignment because of the compensation and then joints begin to wear unevenly. This is true no matter what your age, however, the more years it goes uncorrected the more work one must do to unravel the compensations. We need alignment so that our joints are properly “loaded” while we participate in as much weight bearing movement as we can handle, keep our range of motion in all joints full and active! It’s not age, its alignment. No matter what your age, we can help you retrain your body to be straighter and more functional without all the pain! When we hear about healthy lifestyles from our healthcare professionals, three things are always stressed: eating healthy foods, getting adequate sleep and exercising regularly. As you know, we’re into healthy lifestyles at Pain Free and we talk a lot about total body alignment and movement. Culturally, we are pretty sedentary with only bursts of movement or exercise adding up to maybe 1 or 2 hours a day. Research is now showing that doesn’t meet our body’s daily movement requirements. THERE IS A BIG DIFFERENCE BETWEEN MOVEMENT AND EXERCISE. EXERCISE typically consists of repetitive motion in a specific area of the body for a specific amount of time. Think treadmill, for example. Our heart rate’s up, one foot in front of the other over and over. We drive to the gym, walk or run on the treadmill for an hour, then we drive back home or work. What are we doing the rest of the day? MOVEMENT is leaving our car at home and walking to the store to buy our groceries. Our heart rate is up, we’re working our lower body and utilizing our upper body carrying groceries home. Now, that might not be feasible for all of us but it illustrates how our bodies are meant to function. Even if we can’t walk to the store, we just need to change things up a bit to add natural movement back into our lives. Begin the day with your Egoscue ecises , take a walk with your coffee, stretch while you read the paper, or step on the trampoline while you watch the news. The more you move, the more your brain will encourage movement throughout the day. We hear a lot about 10,000 steps. Instead of stressing over a number, seek any opportunity for movement – all types of movement. Park further away, walk to your destinations, take the stairs, work-in a zumba class – whatever you love to do. The movement will add up. Lasting results begin with subtle changes in the way you move through your life! People ask us if standing work desks are really healthier than sitting. Absolutely! Also think about working from the floor, at a coffee table, on a pillow or in any other way you can imagine. If you can’t do this at the office, try it at home. Stand awhile, sit awhile. The take away is, this encourages your body to respond and move in the way it was intended. Your joints will be more fluid, increase your functionality and keep you moving well for a long, long time! Why not encourage natural movement while taking care of business? Take a walk down the hall or up and down the stairs while you return phone calls. Your heart rate will increase, your feet will be happy, and your mind will be clear and rejuvenated from this much needed movement break. Stand a stretch every hour or so. Keep moving. Home after a hard day, maybe you’re planning to catch up on your favorite Netflix series. Instead of plopping on the couch, try the floor. Put your back up against the couch. Cross your legs, or put them straight out in front of you, or pull your knees up to your chest. Better yet, do all of these periodically! Floor sitting allows your hips and knees to bend at angles that are lost in our culture. Using the floor, instead of chairs or the couch, stimulates your muscles to be more flexible, stronger, and more efficient. It’s not movement OR exercise. While it’s important to know the difference, fill your life with both. As Postural Alignment Therapists at Pain Free Performance, certified by Egoscue University, we teach total body alignment to create your very best function without pain. Incorporate movement in your life the same way. More movement, of all kinds. All of your functional muscles and the resulting properly aligned joints need to be used all day every day in as many ways as possible. Total alignment, total movement, for a totally enjoyable healthy life!